This is a brief summary post of our trip that I'm writing specifically for fellow users of the ThornTree and BootsNAll forums which I also used while planning out trip. It's a bit of a thankyou for their help and also a way of providing what I hope is some of the most useful information we can share for others using the forums who are planning a similar trip. Accommodation: MacDonald Hotel near Kings Cross Station. 70 pounds/night for triple room. Includes an excellent breakfast (bacon, eggs, sausages, baked beans, toast, cereal, yoghurt, coffee, tea, juice. Shared bathrooms although there is a handbasin in your room. Water pressure in shower a bit miserable and temperature difficult to regulate. Rooms were a bit tired-looking but beds were comfortable and the place was clean. No lifts so if you are mobility impaired this is not the place for you. Wi-fi was free and signal was dodgy. Would recommend. Things we did that I would say don't bother doing: Going inside St Paul's Cathedral. I wish we'd gone into Westminster Abbey instead. The view from St Paul's was nice and the church was interesting but I don't think it was worth 18 pounds. Andre liked it though. Accommodation: self-contained apartment at 69 Rue St-Martin in the 1st arr. 80 euros/night and it sleeps up to 4 people. Excellent location and close to metro. Walking distance from Notre Dame and many other central-Paris locations. Close to mini supermarkets. Beds comfortable and kitchen, bathroom & laundry were well-equipped. Franck (the owner) was very friendly and helpful. Wi-fi was free and signal excellent. Would recommend. Things I wish we'd done: Andre really wanted to see Versaille but we didn't get the chance. I also would have liked to look around the Latin Quarter some more. Things we did that I'd say don't bother doing: If paintings are not your thing, then perhaps don't bother with d'Orsay. However I am into paintings so I enjoyed it. Accommodation: self-contained apartment at Belambra Club IV. 70 euros/night for a room that sleeps up to 4. Kitchen not well-equipped and as it was the end of the ski season the place was poorly staffed. Laundry not well signed so we had difficulty using the laundry until we bumped into the one employee we saw the whole time we were there. Could have been cleaner. On the plus side it was ski-in ski-out which we LOVED. Nearly everything in Tignes is ski-in ski-out though. We used a booking website and there seemed to be some communication issues between Belambra and the booking site in regards to our payment. Wi-fi was free and signal was dodgy. They communicate via snail-mail rather than email which is absolutely absurd when we're in Australia and they're in France. Keep sending letters requesting payment after we have paid. Would not recommend. Favourite things we did: Skiied and snowboarded! Things we did that I'd say don't bother doing: Nothing. Spend all your time on the slopes! We were there in the last week of the season and conditions were spectacular. Temps meant the snow was pretty slushy by about 3pm but snow cover extended right down to the village (unusual for that time of year). Accommodation: Valley Hostel. 99CHF/night for triple room. Shared bathroom, kitchen & dining room. We stayed in the guest house with self-catering resources, not the hostel. Apparently the place was booked out when we were there but we saw like 2 people the whole time. Always had the kitchen and dining room to ourselves. Awesome views of the valley from our bedroom. Wi-fi was free but I can't remember what the signal was like which probably means it was good. Would recommend. Favourite things we did: we chose to go to the Lauterbrunnen Valley with the intention of doing nothing - a few days to chill. However we did enjoying going down the valley to see the Trummelbach Falls. Things I wish we'd done: I wish we had been there a few weeks later and able to do the via ferrata, which is closed most of the year except for summer. A lot of people also recommend the Jungfrau but at over 100 francs each we didn't bother. If we had a bigger budget and maybe a bit more time I would like to do it. Things we did that I'd say don't bother doing: We took the cable car up to Murren one afternoon. We were there in off-season and in alpine places like Murren that means the place is dead. This might have been ok if we didn't pay about 30CHF per person just to get there & back. The weather was also very unpredictable and while cloudy, drizzly and freezing when we were up there, twenty minutes after getting back to Lauterbrunnen it had cleared up again and the sky was blue and sunny! I'd say don't bother visiting Murren in off-season. I don't know if the other little villages are any better. Accommodation: Eleven Rome B&B. About 65 - 70 euros/night for a triple room via wotif.com. Included breakfast but not a very big one. If you need a decent breakfast you will need to buy more breakfast when you go out. Good location, we walked nearly everywhere. Friendly host but he made us move rooms half way through our stay with no explanation. Comfortable beds and clean rooms. Shared bathrooms. Might recommend. Favourite things we did: Colosseum, Palatine Hill, Roman Forum, Trajan's market (from the outside), Trevi Fountain, Pantheon, Vatican Museum, St Peter's Basilica, via Appia Antica (the Appian Way), Giolitti's Gelato. Things I wish we'd done: I had been really keen on seeing Ostia Antica, the ancient Roman port just outside Rome, but after several days of seeing lots of really old stuff we were just over old stuff so spent our last day chilling and walking through parks! I would still like to see it though. Things we did that I'd say don't bother doing: Unless it particularly interests you I'd say don't bother going inside Trajan's market. In all fairness we did go and see it after a big day of walking through lots of other ancient Roman sites and as much as ancient Rome fascinates me I was ready for a break. Also, don't bother going to any gelato shop other than Giolitti's. Ok, just kidding. Kind of. Accommodation: Camping Michelangelo. 16euros/night each in a permanent three-bed tent. Tents are clean and beds are comfortable. No catering facilities but there is a mini-mart on site and a pizzeria. Excellent location with a great view. 12 hours free wifi only if you buy something from the bar. Good signal. Bit of a walk from the city centre - tougher when you are walking back uphill. Just get the bus if you have difficulty with the walk. Would recommend. Favourite things we did: Leonardo da Vinci's machines; Piazzale Michelangelo; just wandering around looking at Florence's beautiful buildings; going to the Accademia to see David; bus tour of the Tuscan countryside where we saw San Gimignano, Monteroggiorni, Siena and a winery. Things I wish we'd done: Due to our short stay in Florence we did not go to see the Uffizi and as we spent Sunday in the city were not able to go into the Duomo unless we wanted to attend a service. I also would have liked to have seen Basilica Santa Croce which houses the tombs of Galileo, Michelangelo etc. Things we did that I'd say don't bother doing: The Accademia was a bit disappointing aside from David. I wouldn't go so far as to say don't bother doing it, as David is worth seeing, but not much else was. Accommodation: Hotel Bernardi. 85 euros/night for a triple room. Shared bathrooms, includes a reasonable breakfast but nothing special. Right in Venice itself, not on the mainland, so it's a great location. Beds were a bit hard but didn't bother me. Free wifi with reasonable signal. The place was clean and the hosts friendly. Would recommend. Things I wish we'd done: I'm still not sure if I wish we'd gone inside to see Doge's Palace or not. I've heard good things about it but I'm not completely sold it's a must-do. I do wish we'd seen the Bridge of Sighs. Can't believe we forgot that. Things we did that I'd say don't bother doing: San Marco's square was interesting to see as it's iconic, so I wouldn't go so far as to say don't bother doing it, but you don't have to allocate much time to it. Accommodation: Stadtalm. 19 euros each per night if in a dorm; 45 euros per night for a double room. Includes breakfast. Shared bathrooms although they are clean. Rustic furniture and rooms were clean enough but could do with a bit more sweeping. Double-booked our double room but gave us a good discount so we stayed in a dorm room. No self-catering facilities and the restaurant closes at about 6 in the off-season. On a cliff with amazing views. Free wifi and reasonable signal. If you don't mind a hostel environment I would recommend. Things I wish we'd done: Nothing really. We saw a lot of Sound of Music sights but did not do an actual 'Sound of Music tour' which you might like to do if you are really keen on the Sound of Music. Things we did that I'd say don't bother doing: Nothing really. A lot of people say not to bother with the houses where Mozart was born and raised. We didn't bother with them so can't say for sure if they're a waste of time or not! Accommodation: Pension Merlin (NOT Hostel Merlin). 660KC for a double room. Private bathroom but shared kitchen & dining facilities. Saw hardly anyone else til our last night there. Free wifi with excellent signal and they have a PC there for you to use for free. Comfortable beds and very clean. Would recommend. Favourite things we did: Kayaked down the Vltava River; visited the Krumlov Castle; had trdelnik; visited a traditional marionette museum. And the food. Wow. Things I wish we'd done: Nothing really. Things we did that I'd say don't bother doing: Nothing really. The gardens of the castle were a bit underwhelming but I think that was because of the time of year we were there and it seemed they were in the process of replacing some plants. Accommodation: Max Emmanuel hotel. 65 euros for a double room and that was on special through a booking website. Supposedly self-contained but kitchenette very poorly equipped. Wi-fi costs and signal was absolutely dismal, even in the foyer. Breakfast costs extra and is expensive - we didn't attend the hotel breakfast. Beds comfortable and it was all very clean. Bathroom very good. Would have been fine except for the price we paid (and the price they normally charge!) you'd expect much better. Would hesitate to recommend. Favourite things we did: Sandeman's free tour. Perhaps not quite as good as our Sandeman's Paris tour but still very good and our guide Liz was very knowledgeable, especially in regards to Nazi history and the old Bavarian rulers. Other things: Dachau Concentration Camp; Hofbrauhaus; Augustiner Beer Hall; Munich Residenz; Marienplatz. Things I wish we'd done: Visited one of King Ludwig's palaces that he built rather than the one he was born in (Schloss Nymphenburg, which we did visit). Things we did that I'd say don't bother doing: Schloss Nymphenburg. It's an impressive building with even more impressive gardens but most of the building is closed to the public. There are a few interesting rooms but I don't think it justifies the price to get in or the time required to get to and from the palace (it's located in the suburbs so depending where you stay it can take a bit of time to get there). Accommodation: Pension Im Malerwinkel. 56 euros per night for a double room. Includes an excellent breakfast. Bacharach is so small everything is located a short distance from everything else. Beds comfortable, private bathroom, everything clean. Would recommend. Favourite things we did: Burg Rheinstein above St Goar, just downriver from Bacharach; wandering through the streets of Bacharach. Things I wish we'd done: Visited a vineyard/winery. We saw plenty of vineyards but I would have liked to actually visit one and maybe do a tour or some wine-tasting. Would have also liked to visit Rudesheim am Rhein but on the day we considered doing that it was rainy and expensive to get to (thanks to the cost of the ferry) - weren't willing to fork out that much when chances were we'd end up spending most of the time indoors! Things we did that I'd say don't bother doing: Burg Reichenstein upriver of Bacharach near Trechtinghausen. Not set up well to cater to visitors. Accommodation: Hotel Keizershof. 45 euros a night for a double room. Simple breakfast included, might not be sufficient for everyone - basically bread-based (toast, bread, rolls) with various spreads, juice, tea and coffee. Rooms a little shabby. Beds comfortable for me but a bit too soft for Andre. Shared bathrooms but showers were great. For about 7 euros they also do the laundry for you - washed, dried, folded and returned to you. Excellent service. Hosts very helpful. Wi-fi was free and signal was excellent. Would recommend if you're on a budget and don't mind staying somewhere a little tired-looking. Favourite things we did: Canal tour; Choco-museum; brewery tour; chocolate-shop-hopping (I highly recommend the hot chocolates from Chocaholic! ); bus tour of Ypres Salient (we went with Quasimodo Tours). Things I wish we'd done: We did virtually everything Brugge has to offer, so nothing really. Things we did that I'd say don't bother doing: We were disappointed by the waffles on offer. It might have just been the shops we went to, or maybe Brugge just isn't that great with waffles! I guess it's still worth having at least one but get recommendations for somewhere good. By Tuesday, 5 June, our holiday had essentially come to an end. We were due to return to London for one last night before getting on a plane to go home. We had a relatively early train, so we checked out at breakfast and went straight to the train station. Brugge train station is very easy to navigate and so we found our train without any problems. From Brugge we took the train back to Brussels, where we arrived about fifty minutes before our Eurostar train back to London was due to depart. We went straight to border control because we knew it would take time as we were leaving the schengen zone (a group of European countries who allow free travel between borders - border control only applies when you are leaving the zone and entering a country not in the zone. Every country we visited was in the schengen zone, except the UK). We had a pretty long queue to wait in, but the staff were efficient and after asking a few brief questions about our travels (how long have you been in Europe, why are you going to London, where are you going after that) we were through. Then we had to queue to get up the escalators to the train platform, and after a bit of a mix-up about where we were sitting (the train came in the opposite direction to what was expected, so our carriage was down the other end of the platform) we were on the train. The people in our carriage took a long time to be seated, so a lot of us were stuck standing for the first ten to fifteen minutes of the trip while people messed around with luggage and seats. The train ride was fairly uneventful and we arrived in London at about 12, realising after a text message from a friend in London (Sean, who we had met in Rome) that we were arriving just in time for the final festivities of the Queen's Jubilee weekend. If we'd had nothing else to do we would have been able to make it to somewhere along the procession route to see the royal family, however we had to get to Greenwich and check in to our hotel. By the time we recharged our Oyster cards which we'd kept from the last time we were in London, got the train out to Greenwich and checked into our hotel, we decided it was probably too late to get a good place to see the procession. So we just watched it on our TV in the hotel room! For our last night we had chosen somewhere a bit flasher to stay - a 4 star hotel in Greenwich (which we still got a decent price on through a third party booking website). It was possibly the most comfortable bed we had the whole trip! Unfortunately I had booked it when we thought our flight the next day was leaving at 1pm, so would have plenty of time to get to the airport. However due to Michelle's scenario, we discovered it had been moved to 9:45am, so we would have to leave early to get to the airport on time. If I'd known it was an earlier flight I would have booked a hotel at the airport! That night we met up with Sean for dinner. 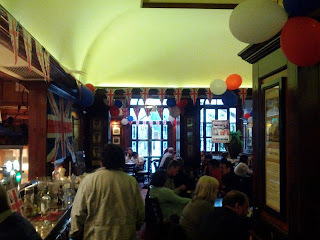 He took us to an english pub near Trafalgar Square which served cheap but yummy meals. Again, we stayed up late chatting for hours, but not as late as we had in Rome as Sean had to work the next day and we had to be up early for a flight and hadn't finished packing yet! The next morning we were up early to head to the airport. The previous afternoon we'd used an online journey planner to figure out what trains we had to take to be at the airport by 8:45, an hour before our flight was due to leave. Nothing we had told us how early we had to be there, but if we were going to get there much earlier we would have had to wake up at 5! In hindsight we should have allowed more than an hour, but we'd only needed an hour when leaving Australia so I didn't think it would be any different flying out of England. But of course, did our train get us to the airport by 8:45 as the journey planner said it would? No, it was slow, and only got us there minutes before 9. And then of course we realised that the trains come in to the South Terminal, and Vietnam Airlines operates out of the North Terminal, so we have to catch the light rail to the North Terminal. Fortunately we got to the platform about a minute before the next train came in so we didn't lose too much time doing that. We got to our check-in counter 40 minutes before the flight was due to leave, and of course it was a mad rush - check in had technically closed, so the airline staff rushed our check-in, gave us priority passes and directed us to take our baggage round to the oversized luggage drop-off to be fast-tracked to the gate. Our priority pass got us straight to security where there were only about two other people going through and we arrived at our gate just as they were commencing boarding. Our last full day in Brugge was cold, windy, and rainy. We started the day again with that wonderful chocolate spread on bread & croissants and were generally lazy. We eventually headed out with the mission of buying chocolate. Belgium is, after all, pretty much the chocolate capital of the world, and we hadn't really eaten very much belgian chocolate yet. The first shop we stopped at was Chocaholic. We bought a few chocolates as presents there, and a box of various pralines to sample ourselves. (It made the flight home a bit more tolerable). They were also advertising cheap hot chocolates, and as it was such a miserably cold and drizzly day outside, we bought some. What they served us surprised me at first; a cup of hot frothed milk, and one of their hot-chocolate sticks that they also sold separately. Basically it's a paddle pop stick with a chunk of chocolate on the end, and you stir it round and round in your cup of hot milk until it has all dissolved. It was like drinking hot melted chocolate. It was divine. I have resolved to figure out how to replicate it at home! We then window-shopped at a few more chocolatiers before stopping in at Dumon. They had less variety and were a bit more expensive than Chocaholic, but we bought a little block of their chocolate for comparison's sake before going off to find lunch. Afterwards we came across a lolly shop filled with far more than just chocolate, and we found actual cuberdon lollies! We had a laugh when we realised our waitress from the night before had probably mistranslated - rather than nose-shaped, they were cone-shaped. Andre reasoned that was still basically nose-shaped. So we had to buy a bag of those as well. Andre also bought three belgian beers to sample at a local shop. Unfortunately they were unrefrigerated, however when we got back to the hotel we just set them outside on the window sill and by the time we returned to our hotel after tea, they were cold enough to have one or two! We had tea at the same place we had waffles on our first day where Andre had a flemmish beef stew made with belgian beer and I had belgian sausage. And of course, for dessert: waffles! As we'd had the Brussels (thick, very light and crispy) waffles previously, we had the normal 'sugar' waffles this time. I got strawberry sauce and Andre had the same butterscotch sauce I had previously. I was disappointed with the waffle. Andre said his was good, but mine wasn't cooked properly and was still a bit doughy in the middle. Overall not that impressed by my belgian waffle experience. We headed back to the hotel via the Minnewater again to take more photos of swans and ducks, and packed our bags ready to leave first thing in the morning. The next morning I had an email from the first tour company saying they didn't have any space in their tours for that day, as I had expected. So I called the second tour company, Quasimodo tours, and fortunately the man I spoke to said yes, they had space! We arranged to be picked up in front of the train station just minutes down the road from our hotel at about 9am. Breakfast was only served at our pension from 8:30, and I wanted to find an ATM to get cash out as I wasn't sure if we could pay for the tour on card, so we skipped the pension breakfast to get to the train station early enough to find an ATM. It was a cold and drizzly day so we had our jackets and scarves on for the first time in weeks. We had no problems locating the ATM to get cash, then went inside the train station to find somewhere to get breakfast. The first thing we saw when we walked in was a little fast-food type bakery, so I got a chocolate pastry & fruit juice and Andre got a muesli, strawberry & yoghurt breakfast cup. We ended up at our meeting spot with heaps of time to spare. A little after 9 we were picked up by Phillip in the Quasimodo bus. He had already collected a few people, and we picked up about another fifteen from another meeting point nearby. In total there were around 20 people on the tour, not small but not too big either. The tour ended up being very good. It was all located around the Ypres salient, about 30 - 45 minutes' drive south of Brugge, depending on the weather and roadworks. Phillip and his Australian wife have been running these tours for over ten years (I think he might have even said twenty years?) so he knew a lot about the area and World War I. I had read a lot about the three battles of Ypres and the battle of Passchendaele before we went, but didn't really understand how it all fit together. He painted a perfect mental picture of how the war started, how the Belgians were caught up in it, and the part the battles of Ypres played in it all. He took us to see Hill 60 where the Australian 1st Tunnelling Company dug and maintained the tunnels below the German front at Passchendaele ridge during the Battle of Messines (featured in the movie Beneath Hill 60). We were able to see a british bunker there, and the remains of a German bunker that has now mostly sunk underground into the muddy clay soil. There are still a lot of undetonated munitions in the ground, so he warned us that we might want to stay to the well-worn path, although there are no fences restricting where you walk. Beside Hill 60 there was an Australian war memorial, which ironically, now bears holes from World War 2 bullets. We also saw several Commonwealth war cemeteries, the largest being Tyne Cot near Passchendaele. We also saw another at Polygon Wood, the site of a significant battle involving Australian troops, where there now stands a memorial dedicated to the 5th Division of the Australian Imperial Forces, which I thought was the division my great-grandfather's cousin served in, but it wasn't. He was in the 3rd Division, which did still fight alongside the 5th Division in, among others, the Battle of Messines and the 3rd Battle of Ypres, which included the Battle for Passchendaele, the 'suicide mission' where the allies decided to launch an assault on the Germans, rather than the other way round as had been the case for the first two Battles of Ypres (which turned out to be an utter catastrophe). We also saw the Canadian war memorial, 'The Brooding Soldier', possibly one of the best war memorials in Belgium, and the German Langemark War Cemetery. Unlike Commonwealth war gravestones, German gravestones are black rather than white (a condition of the Treaty of Versailles). They also normally lie flat on the ground, not upright, and this particular cemetery is modelled not like a garden (like the Commonwealth ones often are), but is covered in plain grass and tall oak trees, a german symbol for strength. The trip also included a visit to the Hooge Crater museum (the crater itself has since been filled in) where we had lunch (somewhat disappointingly, just a sandwich, but it was included in the price so can't complain too much) and to Ypres where we saw the Menin Gate, engraved with the names of Commonwealth missing soldiers from WWI bar the New Zealanders (who requested their names be recorded at memorials located at the actual battle sites). We also saw one of the few restored trenches in the area and even that has not been very well restored. Our guide Phillip was very critical of the poor effort the Belgians have put in to conserving their trenches and bunkers, in comparison with countries like France that have done a very good job. Belgium has now realised the opportunities they have missed out on and is now scrambling to recover and restore as much as it can (I think he said they are even digging and building new trenches), spending much more than they would have originally if they had just restored trenches and bunkers as they discovered them. I think he said there are only two restored trenches in the Ypres Salient area. Phillip also took us to a farm off a side-road to show us some of the 'iron harvest', the various shells that farmers still, reasonably regularly, recover from their fields. Belgians recover, on average, 200,000kg of munitions each year, one third of which is still live. They just leave it by the side of the road for the military to recover, which can take a few weeks! As a result, these shells just sit by the road for anyone to come and look at and take photos of. One lady in our group asked, "so how do you know these won't blow up right now?" Phillip looked at her, at the shells on the ground, then back up at her and shrugged and said "I don't really! But they've been there for 90 years and haven't blown up yet so they're probably ok. I wouldn't go throwing them around though!" I loved it because I thought there was no way in the world that would ever happen in Australia! Despite getting very wet feet from walking around in sodden fields in perpetual foggy rain all day, we had a very good trip. Not only did we see some of the most important Commonwealth WW1 sites, but Phillip was very knowledgeable and seemed to know pretty much everything there is to know about Belgium and the Commonwealth's involvement in WWI. That night we decided to have our anniversary celebratory dinner, and 'went out' for dinner at the restaurant right next door to our hotel. Andre had marinated pork ribs with mashed potatoes, and I had sugared ducks leg served with roasted potato and baby carrots. The ribs were a bit dry, but the mashed potatoes were excellent. My duck's leg was very well cooked, the best duck I've ever had - not at all dry, I kept referring to it as chicken by mistake. The veggies were also very tasty. For dessert Andre had cuberdon ice-cream and I went with what belgians know best and had chocolate mousse. At first we didn't know what cuberdon was, so we asked the waitress who took our order. "It's, uh... hmm, I am not sure how to say in english... it's a lolly, it's very flemmish, it's.... umm, I am not sure how else I can describe it... it is nose-shaped, it's a nose-shaped lolly." Intrigued by this, Andre decided to go ahead and order it anyway. It was a very, very familiar flavour, but we couldn't pick it for the first ten minutes or so. It was a pinky-purple coloured ice-cream with crushed musk lollies on top. After a while, I picked it - "fairy floss! The good fairy floss, like from The Show, not the free stuff you get at O-week. Raspberry! Pink raspberry fairy floss!" And that's exactly what it tasted like. The mousse was also very good, though perhaps not quite as set as I'm used to. Overall it turned out to be probably one of our favourite days out of the entire trip! Our first day in Brugge turned out to have beautiful weather. Breakfast was a little bit odd, they only served various breads with spreads - white & wholemeal bread, raisin bread, toast, bread rolls and croissants. No cereal, fruit, yoghurt etc. But they did have an amazing chocolate spread. It tasted just like my favourite chocolate spread which was the stuff Woolworths' homebrand used to make about fifteen years ago before they added hazelnuts. We first decided to visit a local brewery which has now been operating for six generations, De Halve Maan (The Half Moon). We took a guided tour of the brewery, with the traditional beer-making methods explained. It was a pretty interesting tour as far as breweries go and they had some good displays with a lot of the old equipment retained. After some beer tasting at the end (I don't like beer at all, so Andre had mine), we had waffles and ice-cream for lunch. We got Brussel waffles, which are much thicker than the ones we typically have in Australia, but very light and crunchy. I had butterscotch sauce on mine and Andre had chocolate on his. They were quite good but I didn't think they were anything especially better than the ones we make ourselves at home. Afterwards we went to the Choco-Story Museum which was pretty interesting. It's a museum about the history of chocolate, featuring the Aztecs, Mayans and Spanish, its development from being a popular drink for the European upper class into a common sweet, the different equipment used in its production and consumption over the years, how it is made, how it is grown and about fifty years' worth of different chocolate packaging. It also had a chocolate-making demonstration where you got to eat the final product, but it was a hazelnut praline so Andre got the rest of mine. Europeans seem to have this obsession with putting hazelnut in all their chocolate! After the chocolate we walked across to the northern end of the old town to see some old-school windmills. None of them were open, but it was interesting just to get to see them. Then we walked back into the town to take a boat ride through the canals. Brugge is very pretty from the water, and one bridge we went under was so low we had to duck our heads! There are also lots of swans, ducks and geese around the canals in Brugge, and many of them had ducklings and we even saw a cygnet! That night at home I checked my emails to check the details of a battlefields tour I had booked for the next day. Or so I thought. Once I read the email, I realised the tour was supposed to have been that day. Whoops. So I raced off a very apologetic email to the tour company, and tried to figure out how I was going to organise a replacement tour within two days. In my email I asked if they happened to have any places on their Sunday tour, but when I went back and read my original emails requesting a booking, I noted that they didn't have any space on the Sunday or Monday. Hmmm. I had a look at the pamphlet for another company I had considered booking with, and they said that we could call anytime between 7:30am and 10:30pm. It was just past 10:30pm by that point, so I decided I'd call them first thing the next morning to see if they had any spaces on their Sunday tour, as they didn't run tours Mondays. Our second day in Bacharach also happened to be our wedding anniversary. As we had been to see castle ruins the day before, we decided to go and see an intact castle. We were tossing up between two near the little town of Trechtingshausen south of Bacharach, Burg Rheinstein and Burg Reichenstein. We decided on Reichenstein as it was a shorter walk from the town. We actually ended up being a bit disappointed with it. They seem to be more interested in attracting functions, especially weddings, than tourists, although they do put out tourist promotional material, so I'm not really sure what their target audience is. There was absolutely no interpretive signage, printed or audio guides, although they had photos of weddings everywhere on the lower level. It was also poorly lit- although we saw electric lights everywhere, none were turned on. Daylight could still get in but lighting would have made the place look better. To our surprise, we were also the only ones there. We still enjoyed getting to go inside a castle, especially as there was access to the top of one of the exterior walls with a good view of the valley. It also didn't cost very much so we didn't feel ripped off, although we did wonder if our time would have been better spent at Rheinstein, or even at one of the castles near Koblenz, a 40 minute train trip down river. We decided then to take the train down to Bingen and get the ferry across the river to Rudesheim. Once we got to Bingen though, it began to rain, and didn't look like it was moving on anytime soon. We decided it probably wouldn't be worth paying for the ferries to and from Rudesheim just to spend only an hour or so there in the rain. So, back on the train we got to Bacharach, after first buying our onwards tickets to Belgium for the next day. We chose a little cafe overgrown by climber vines for dinner. We chose a cheaper place as we had already had a few more expensive meals in Germany, and decided we would have a fancier anniversary meal in Belgium. However it was very good value, and André had a rabbit dish. We also got very German desserts- apple strudel with ice cream, and a black forest (schwarzwald) ice cream sundae (vanilla and chocolate ice cream with cherries, chocolate sauce and cream). The next day it was time to move on to Brugge (or Bruges) in Belgium. Our trip required a few change overs - first 40 minutes to Koblenz, then on to Köln (Cologne), then a high speed train to Brussels in Belgium. We had a bit of a break in Brussels before catching a regional train to Brugge. Our pension ended up being a very short walk from the train station, just inside the old town. We got there at about 3pm so after we checked in we had time to wander into the town square and investigate the shops, including taste-testing the fries that Belgium is famous for. Not terribly impressed, and the whole eating fries with mayonnaise is weird. They still offer you ketchup though (I don't know why Europe has adopted the American term) which André liked, especially as Belgian ketchup seems to have more sugar in it than Australian tomato sauce, and a spice that I first thought was cinnamon but now think might have been nutmeg. For dinner we found a cheap little döner & kebab shop among the more expensive restaurants in our area with a friendly owner who lives upstairs from his shop. The daylight hours in Brugge were crazy. It was the furthest north we had been in several weeks, and now that it's summer, it didn't get dark until about 10:30. This resulted in some late nights because it just didn't occur to us to get ready for bed while it was still daylight! We did not pre-book our tickets from Munich to Bacharach in the Rhine Valley as we had checked on a ticket machine previously and found the necessary trains ran reasonably often. So we decided we would take an afternoon train to give us a bit more time in Munich. In the morning we first went to the hoptbahnhof, or central station, to put our bags in lockers. We also bought our tickets then so that we could make any necessary seat reservations. From there we went back to Marienplatz to explore the markets that had been closed the previous two days. We bought some cherries and a beer for André but before long it began to rain. We headed back in the direction of the train station, ducking into a few shops along the way to escape the rain and buy a few more presents and souvenirs. Because the rain seemed to have set in, we went back to the Hoptbahnhof early, where we found a post office to send another parcel back to Australia. Lucky we did go back early, because there was quite a line up in the post office. After that it was pick up the bags, get some lunch and find our train to Bingen am Rhein. We switched trains in Bingen, to a local train that took us the last twenty minutes up the valley to Bacharach. Bacharach is only a very little town, with one main street a few hundred metres long and half a dozen smaller back roads. It's filled with old half-timbered buildings and has vineyard-covered hills behind it, with a castle on top (which is now a youth hostel). Our pension was located down one of the side streets, and was a half-timbered building built onto the old city wall. The room was very spacious and was actually a triple room just for the two of us, and we got a private bathroom again! The first night we had dinner at a small restaurant just down the road from our pension, and sat by the front window which opened onto the cobble stoned street outside. For our first full day in Bacharach we walked up the hill behind our pension to see the castle Burg Stahleck. It wasn't a long walk, and along the way we also saw the ruins of a gothic chapel. Once we got to the castle we couldn't go in to see too much, as it's a youth hostel, but they did have a courtyard we went into. It gave a good view of the valley below and part of the castle exterior. We didn't spend long there before catching a train north to the little town of St Goar. We explored the idea of taking a ferry, but it was so slow, didn't run often from Bacharach and even less often in the direction we wanted, and was a lot more expensive than the train. We went to St Goar primarily for the complex of ruins of the castle Burg Rheinfels which stands on the hill above it. Part of the castle has been restored into a 4-star hotel now, and part into a restaurant and gift shop. Otherwise it stands in ruin, but when you purchase entrance (only 4 euros) you are given a leaflet which outlines two routes around the complex, explaining what each area was. The directions on it weren't always easy to follow, but we did both paths around the castle and ended up with a good understanding of how the castle once was. The ruins are in pretty good condition, with a lot of rooms, tunnels, towers and passageways still intact. We spent most of the day at Burg Rheinfels and watched ferries go by on the river while we waited for the next train back to Bacharach. Dinner was at a restaurant with an open courtyard surrounded by half-timbered buildings where we were appropriately German and André had pork roast while I had what I think were pork sausages and fried potato. We finished the day with gelato! I had mango and lemon which was very good, but still not quite Giolitti's! This is basically a blog for our friends and family to follow our trip around Europe. We will be gone for seven weeks as we travel through England, France, Switzerland, Italy, Austria, Czech Republic, Germany and Belgium. While the blog is labelled 'Andre & Leah', my sister Michelle will be joining us for the first 4 weeks. I'm looking forward to dusting off my journalist/writing skills and hope this blog will be a useful tool for other people planning overseas holidays too. Travel theme. Theme images by GP232. Powered by Blogger.